People with diabetes still face a higher risk for influenza and its complications. National and international guidelines therefore advise that diabetes patients be annually vaccinated against influenza. 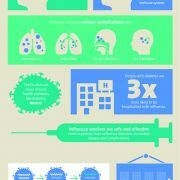 But the attention for the impact of influenza on diabetes patients is low and so is the influenza vaccine uptake in this group, despite the scientific evidence that influenza vaccination is beneficial for people with diabetes and WHO’s recommendation to routinely vaccinate 75% of all people at high risk. To help increase influenza vaccination coverage, ESWI has now developed infographics that illustrate the risks of influenza infection for people with diabetes and the possible strategies to prevent such infection. Feel free to download and disseminate.